The Aggi-Vacchagotta Sutta is a Buddhist sutta in the Majjhima Nikaya of the Tripitaka. In this sutta, Gautama Buddha clarifies his views on the nature of existence and explains the nature of nirvana to Vacchagotta by means of a simile. Nirvana is compared to an extinguished fire, a common theme in Buddhist thought. Vacchagotta first asks the Buddha whether he holds particular views on the extent of the cosmos, the relationship between mind and body, and the nature of a Tathagata‘s existence after death. To all the questions, Gautama Buddha simply replies he does not hold such views. Vacchagotta expresses confusion at this answer and asks why the Buddha takes no position regarding his questions. The Buddha explains that each question leads to an unresolvable thicket of views which will cause suffering and distress if investigated. Because such investigation cannot lead to enlightened understanding and nirvana, the Buddha takes no position on these subjects. The Tathagata is released due to true discernment and cessation of clinging. Vacchagotta’s confusion increases. The Buddha turns to the simile of the extinguished fire to clarify. He asks Vacchagotta to consider a fire, dependent upon fuel to sustain it. If the fuel is exhausted or removed, the fire goes away. In which direction will the fire have gone? Understanding is reached: there is no direction in which a fire can be said to travel in when it burns out. The attribution of direction doesn’t apply. Gautama Buddha explains that nirvana is just so, an unbinding from the conditions necessary for existence. 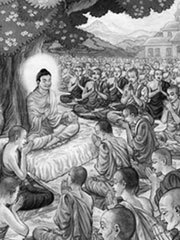 The Tathagata will not experience rebirth; due to anatman, no attributes can be said to apply.